A Campaign for the VCU Women's Basketball Team. They asked us to help them fill more seats at games. Instead, we created an entire campaign for the team. Providing them with a platform, an identity and a voice that will attain support far beyond just the basketball arena. The problem goes beyond just filling seats. The community doesn’t show the same level of interest in women’s basketball as they do for men’s basketball. On top of the societal stigmas, the team is young, inexperienced, and unknown. Not to mention the fact that they were projected to finish near last in the conference. We realized our goal was less about trying to fill seats, and more about telling their story that filled those seats. On the court, the team refuses to quit, regardless of the circumstances. Off the court, the team is passionate about fighting for those who suffer from social inequality. To be a woman, and to be part of this team, is to persist despite the obstacles. Insight: The team’s mentality on the court resonates with those they fight for off of it. 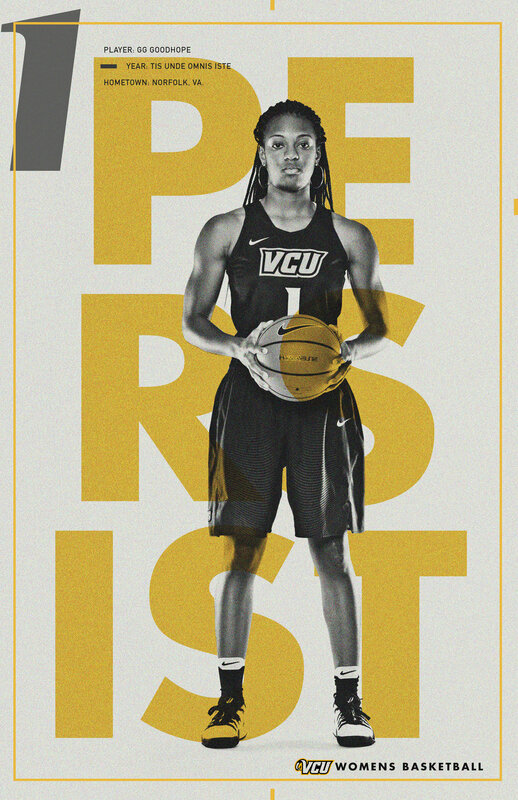 Strategy: Recruit new fans for VCU Women’s Basketball by speaking for those who continue on, despite the odds. The team has been highlighting individual stories of persistence on social as a soft launch. to show their support for the team.